At the time, the deliberate killing of this young, female American, human rights activist by the IDF, was a cause célèbre that demolished the Israeli claim to be ‘the only democracy in the Middle East’ and contributed to an upsurge of anti-Zionist feeling throughout Europe. However, the Israeli government refused to heed that lesson, with the result that just seven years later, on May 31st 2010, the Mavi Marmara, a Turkish registered vessel carrying humanitarian aid to Gaza, was attacked by Israeli commandos in international waters, who then killed nine of its civilian passengers. The Israeli government was subsequently forced to pay compensation of $20 million. Six months earlier, the Israeli government assassinated a Palestinian politician in a Dubai hotel, by a gang using forged passports from various EU member states. 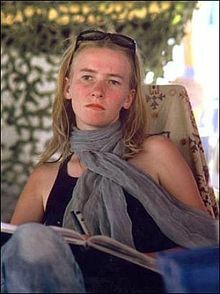 The Israeli government clearly has no compunction in using violence to achieve its political aims and Rachel Corrie was tragically just one of its civilian victims. Which again ‘begs the question’: why does the British government ally itself to a regime that is so totally foreign to British (and European) standards of morality, humanity and legal process? Israel’s neo-colonialism – condemned by both the UN and the EU – is only made possible by its international trading links. Break these links, and Israel can be forced to end its occupation and its illegal settlements, and to agree to a negotiated peace settlement for an independent Palestinian state with East Jerusalem as its capital.